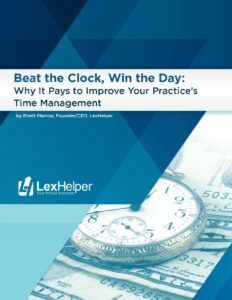 This blog post is a companion piece to the LexHelper white paper “Beat the Clock, Win the Day: Why It Pays to Improve Your Practice’s Time Management.” Download the complete white paper here. 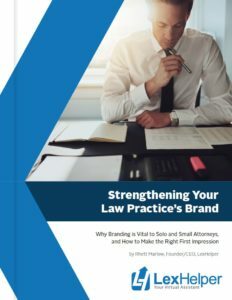 Legal practitioners face many specific time management challenges, and you can read about the recommended solutions in our white paper. Here are several quick time management tips as an addendum to our April guide, appropriate for counselors or anyone feeling overwhelmed by the daily grind. Ironically, getting the most out of your work day is largely contingent on your lifestyle habits and how you spend your personal time. Are you getting 7-8 hours of sleep every night? Are you eating right? Taking the time each night to reset and find a place of calmness? If you start your day fatigued and frazzled, your productivity will be handicapped no matter the good habits you follow during office hours. During your morning routine, include an extra 10-15 minutes to think about how your day should flow for maximum productivity. What are the desired outcomes of meetings, case work and appointments? What’s required to make those desired outcomes a reality? How much time should each task take? Look at your calendar and block out a realistic time for your important projects. Good habits are developed through constant repetition. If you’re a morning person, plan to take care of case work bright and early. If you need a cup of coffee (or several) before you warm up, make sure your mid-to-late morning period is reserved for the work requiring your sharpest mind and most abundant energy. You’ll never be able to get it all done each day, but you can get the most important things done if you prioritize your time. Front-load your day with essential tasks, and if you absolutely must do “busy” work, do it after your peak productivity window later in the day. Delegation is very important for counselors. So important that our April white paper is dedicated to all the things you need to unhook yourself from in your daily schedule. 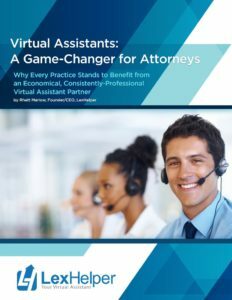 Your time should be spent on the moneymaking work of your practice, and if your day allows for activities that are handicapping your revenue, you need to make changes. 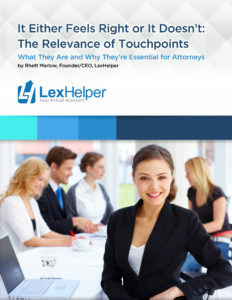 Read our white paper to find out how to make that happen.